On our travels, we’re often looking at the buildings and artifacts of the past. But how often do we truly consider the people of that earlier time? 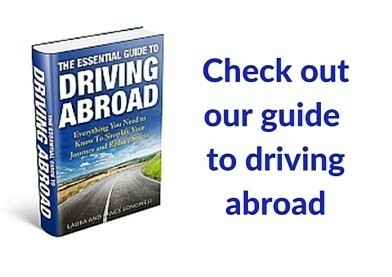 On our recent travels, we’ve sought out some of these personal stories. 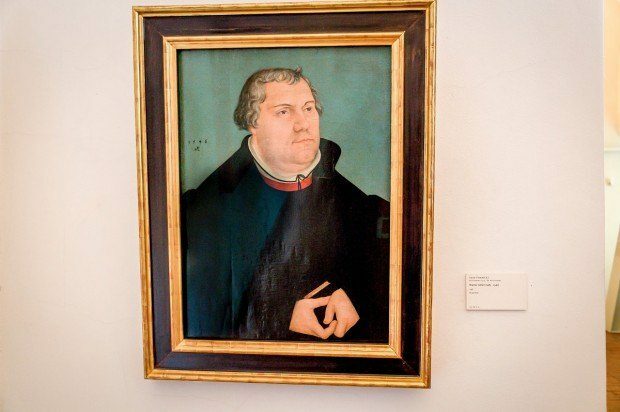 On a recent trip to Central Germany, I encountered a man who played an important historical role, but has been relegated to a mere footnote: the painter known as Lucas Cranach the Elder. I wasn’t looking for Lucas Cranach when I came to Germany and had never heard of him before. But it seems like at every turn, I encountered this man and his works. During my visit, Germany has declared the official “Year of Cranach” to promote his legacy. In the past, when Lucas Cranach the Elder has been remembered by history, it has not always been favorable. Prior showings of his work have noted that he is “one of the strangest Renaissance artists” and his works have a “suggestion of sarcasm.” And those are the positive reviews. He’s also noted as being “a man seized with cold rage,” whose paintings have a “disturbing irony” and his work is “almost oppressive.” His paintings of women have been deemed “overtly sexual,” borderline pedophilic and far more suggestive than other painters of the day. Lucas Cranach lived in Central Germany in the last half of the 15th and early 16th centuries. He was one of the most prolific painters – ever. During his 81 years and using his skills acquired throughout Europe, he produced countless works. Like other German Renaissance artists, he played a role in the development of the modern pencil. Soon, Cranach was a favorite court painter and was deeply ingratiated to the aristocratic class in Germany (especially Emperor Charles V). 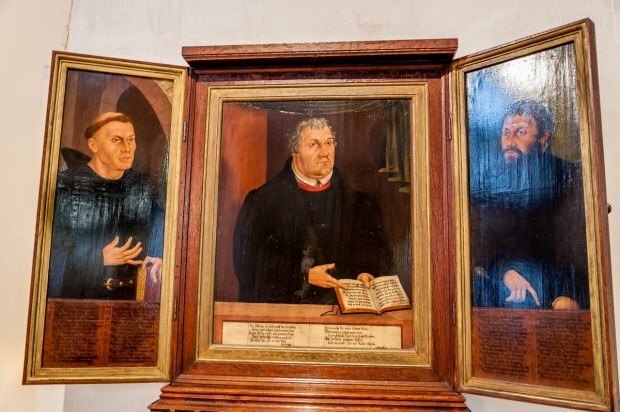 But most importantly, Cranach was close friends with Martin Luther and was named godfather to Luther’s first child, Johannes Luther. Cranach had a ringside seat for the Reformation and used his skills and position to document it. It’s worth noting that this isn’t my religious tradition. I don’t have an opinion on the spiritual doctrine of either the Catholic Church or the Protestant Reformation. I’m viewing the man Lucas Cranach, his art and even the historical context as that of an outsider. 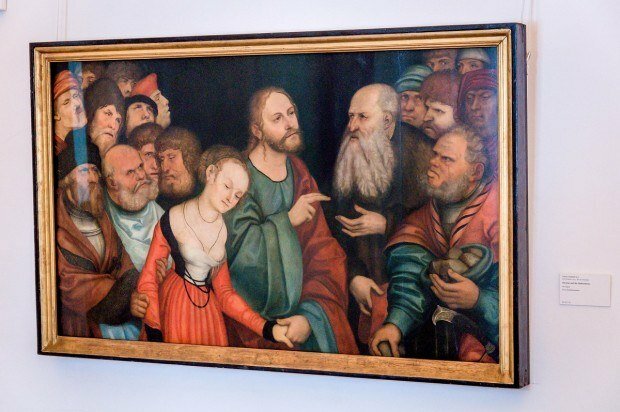 But that’s precisely why I sought out Lucas Cranach and his work after stumbling on him. Not coming out of the Christian tradition, I wanted to learn about it. He lived, witnessed and documented an extremely important period of world history – the Reformation and turmoil in Europe. Early in his career as court painter, Lucas Cranach the Elder came to Coburg to focus on his representation of animals. During his stay, he created a vast number of royal portraits, many still survive. 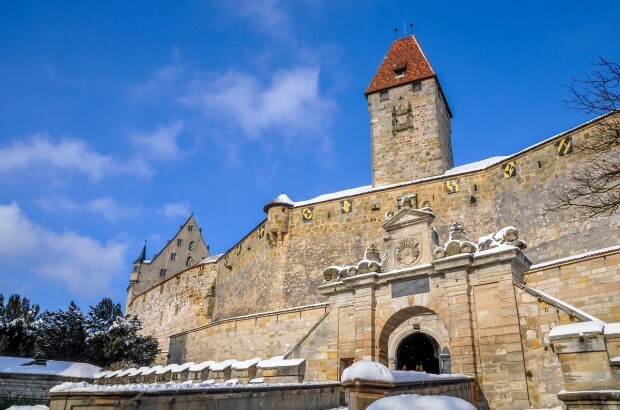 Today, the Coburg Fortress is home to a large collection of Cranach’s work. 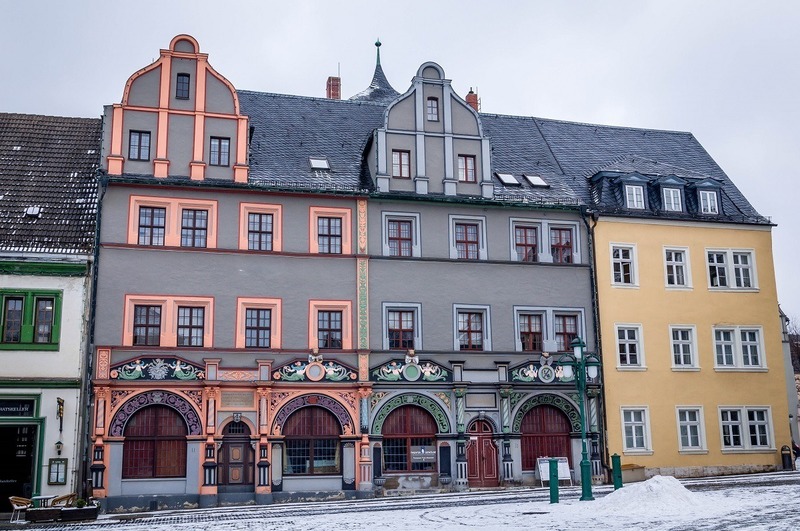 While in Erfurt, Germany, I spent an afternoon on a marvelous walking tour of the city. 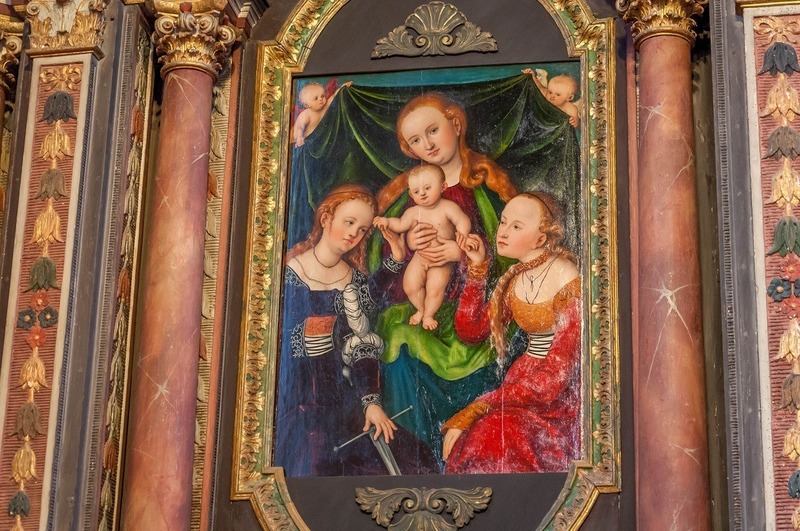 The guide pointed out an important work by Lucas Cranach the Elder inside the St. Mary’s Cathedral. The Mystic Marriage of St. Catherine is a very popular motif in Christian art and we’ve seen it before on our travels. The premise is that St. Catherine, a virgin saint, is mystically wedded to the baby Jesus (which always kind of creeps me out when I see it). But Lucas Cranach’s painting is unusual in that it is a rare double wedding of both Saint Catherine of Siena and also Saint Catherine of Alexandria to the infant Jesus Christ. Wartburg Castle is one of the most important sites of the Protestant Reformation. 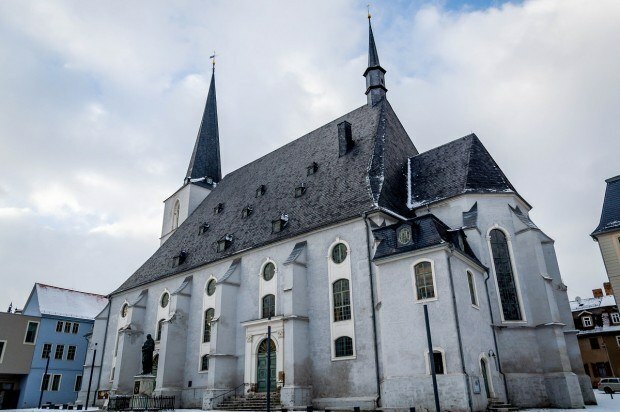 It was here that Martin Luther went into hiding and translated the Bible into German – putting the gospel in the hands of the people for the first time. A number of important works by Lucas Cranach the Elder are displayed at the castle, including portraits of Luther’s parents. 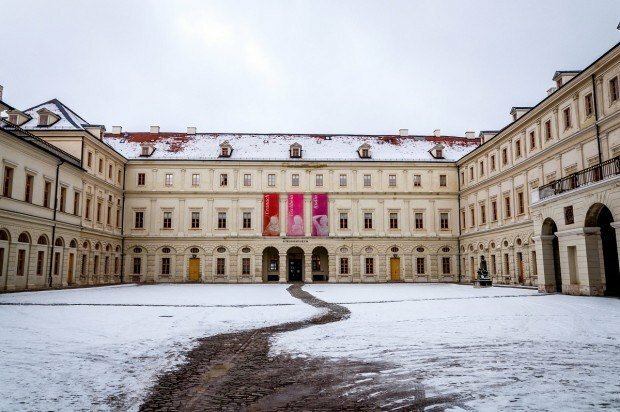 Weimar was Lucas Cranach the Elder’s final home. His palatial residence still stands on the main market square. Many of Lucas Cranach’s most important paintings are on display at the Palace Museum in the Cranach Gallery. 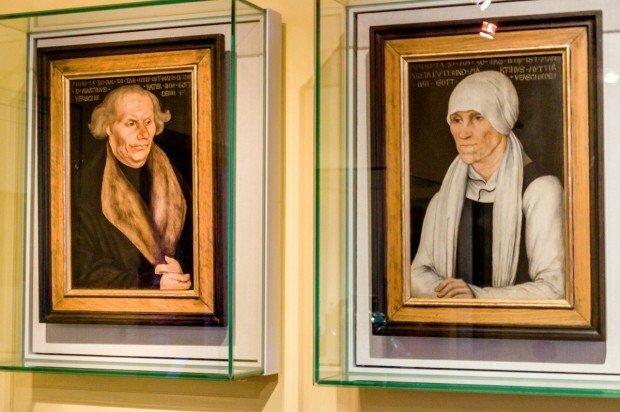 Here, we can see portraits of Martin Luther as well as Christ and the Adultress, a theme he painted nearly a dozen times during his life. However, the important site in Weimar is the Church of St. Peter and St. Paul with its massive Cranach altar. This was the painting of the crucifixion I had sought out. Here, Lucas Cranach and his friend Martin Luther attend the crucifixion of Jesus Christ and Cranach is bathed in Christ’s blood. 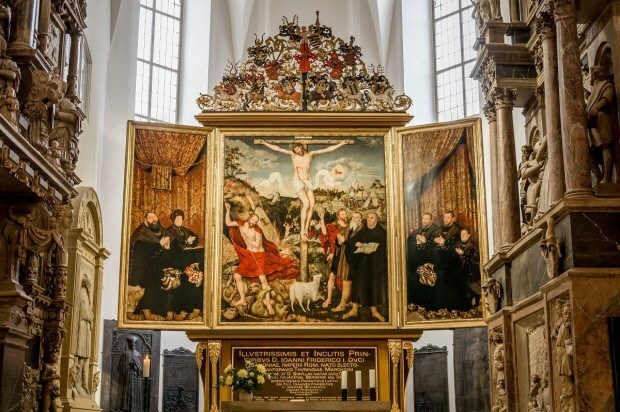 This is an explosive political commentary: it indicts the Catholic Church and states no priest is needed to stand between the common man (Cranach) and god. It truly is a beautiful painting. Nearly 500 years after the Protestant Reformation, it was interesting for me to see this troubled period through the eyes of an eye witness. I didn’t go looking for Lucas Cranach the Elder on my travels in Germany, but I’m glad I discovered him. While in Germany, I was the guest of the German National Tourist Board. I’m grateful to the GNTB as well as Thuringia Tourism, Weimar Tourism, the Erfurt Tourism & Marketing Board, and the Eisenach Wartburg Region. As always, all opinions are my own. 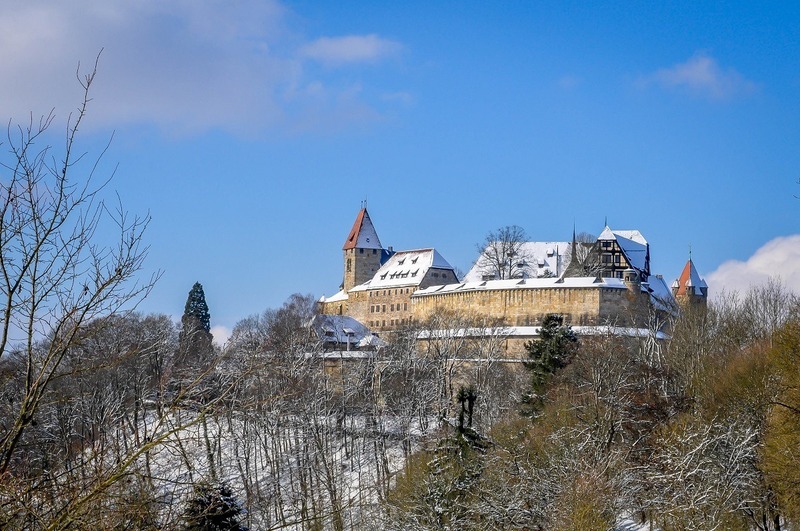 What do you think about In The Footsteps of Cranach in Germany? 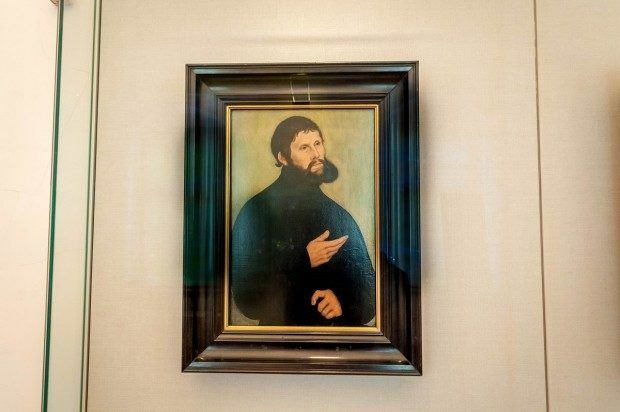 I love your search for Lucas Cranach! You reveal some of the strange and yes, creepy ideas they had back in the day, like the mystic relationship between St. Catherine and the baby Jesus. 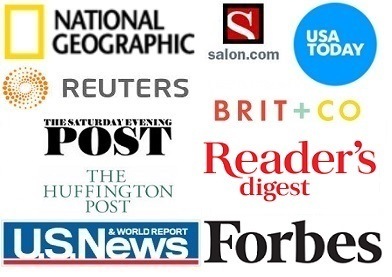 Don’t you wish you could time travel so as to get a “real” read on the culture? Anyway, a very thoughtful and informative post. Thanks Josie. Not coming out of this religious tradition, I often encounter things and have to ask Laura or someone – is that real? Do people really believe that happened? These trips, particularly to Europe, are always so educational for me.